This article is about the stock character. For other uses, see Space pirate (disambiguation). Cover of the The Space Pirate, 1953 by Jack Vance. 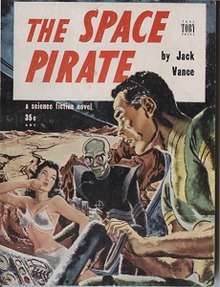 Space pirates operate as pirates in outer space and travel by spacecraft, as opposed to the more traditional pirates on the high seas of Earth, who travel by ship. However, just as traditional seafaring pirates target sailing ships, space pirates serve a similar role in sci-fi media: they capture and plunder spacecraft for cargo, loot and occasionally they steal the entire spacecraft itself, and kill the crewmembers. However, their dress and speech may vary; it may correspond to the particular author's vision of the future, rather than their seafaring precursors. On the other hand, space pirates may be modeled after stereotypical sea pirates. They may be humans who originate from Earth, or a specific race of aliens. 1 2 3 Westfahl, Gary (September 30, 2005). The Greenwood Encyclopedia of Science Fiction and Fantasy: Themes, Works and Wonders. 2. Greenwood Press. pp. 600–601. ISBN 0-313-32950-8 – via Google Books.